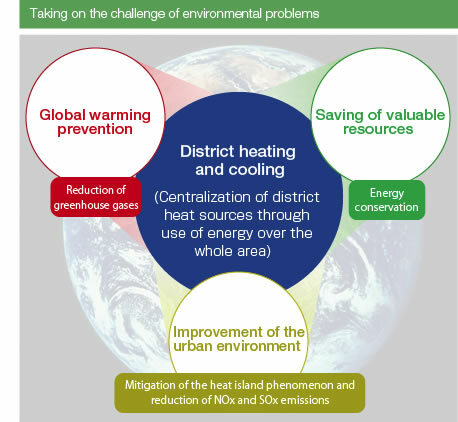 Advantages of district heating and cooling | Minato Mirai 21 District Heating and Cooling Co., Ltd.
Environmental benefits Centralizing the heat source of the district saves energy, reduces greenhouse gas emissions, and results in substantial reductions in nitrogen oxide and sulfur oxides, which can cause air pollution and acid rain. It also has a significant effect in mitigating the heat island phenomenon. The improved operating efficiency realized by centralizing the facilities and the use of efficient, advanced systems for thermal storage and other processes result in energy savings across the district as a whole, helping to conserve valuable resources. With stand-alone heat sources, the capacity of the heating equipment and the demand for heating and cooling often do not match, which tends to result in operation at low capacity. However, with district heating and cooling systems, high-performance, industrial-scale equipment is employed to meet the total demand for heating and cooling within the district, achieving near full-capacity operation. At MM21 DHC, this yields energy savings of about 15% in terms of reduction in primary energy consumption. In a comparison of district heating and cooling, which features central management of boiler and chiller facilities, and the conventional approach, in which urban buildings are heated and cooled individually, the difference in energy consumption can be seen in the different levels of carbon dioxide emissions. In the Minato Mirai 21 District, the reduction in carbon dioxide emissions from using district heating and cooling is equivalent to the CO2 sequestration capacity of around 1,500 ha of forest (approx. 3,700 acres, or 570 times the area of a major arena like Yokohama Stadium). This helps to ameliorate global warming. In addition, since the city gas used contains no sulfur, the system significantly reduces emissions of sulfur oxide. The heat island phenomenon occurs when urban environments maintain temperatures higher than their surrounding environments. One solution is to reduce the emission of heat which causes this. District heating and cooling systems significantly alleviate the amount of exhaust heat generated from cooling and heating, both through the use of centralized boiler and chiller plants and by using latent heat treatment that does not raise air temperatures. Another cause of the phenomenon is the relative lack of green spaces in cities. Eliminating cooling towers and chimneys from the roofs of individual buildings allows that space to be used for rooftop gardens, which also helps to mitigate the heat island phenomenon.